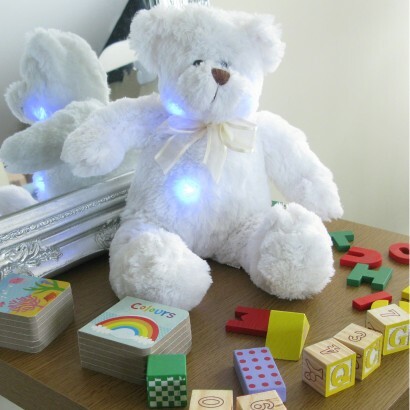 A supersoft teddy bear that will make little ones look forward to bedtime, the Light Up Blushing Teddy Bear has colour changing LED's hidden inside his soft cuddly body. 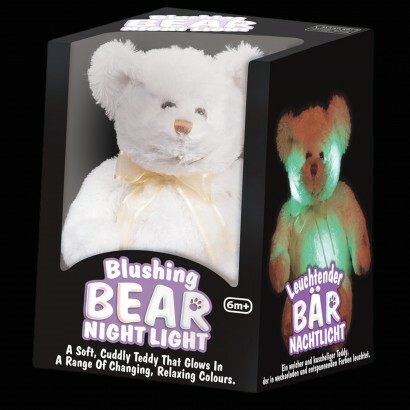 Press his paw and the adorable teddy bear will "blush" in tones of red, blue and green in his cheeks and even his tummy! 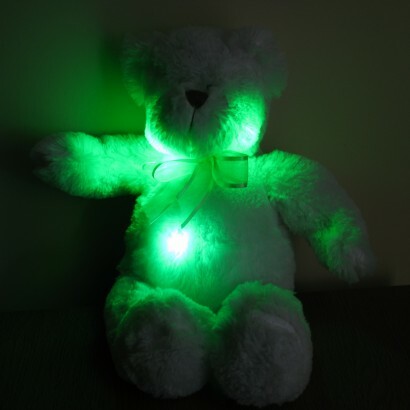 Perfect for little ones that have insecurities about the dark, this cute plush will help younger children to feel more confident in the dark by offering a gentle night light and a friend to cuddle tight as they drop off to sleep. Suitable for even the youngest of children, this snuggly bear is suitable for children ages from 6 months plus and is guaranteed to become a firm favourite that will be loved at bedtime and beyond! The glow balls inside were very prominent in that you can feel them through the fur which I didn't like. Also, there is no automatic shutoff so you have to manually press for the bear to stop. Delighted with my purchase. It is going to be a gift for my great grandson who will be born in a month or so. Delivery was very prompt. This is such a lovely little bear and I am so glad I bought it for my granddaughter. She is delighted with it!